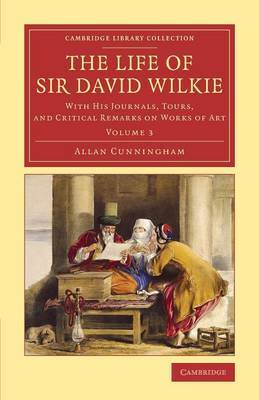 Sir David Wilkie (1785-1841) is often called the first truly international British artist. This three-volume biography, published in 1843, two years after Wilkie's sudden death while on a tour of the Mediterranean, and containing extracts from his journals and letters, remains an indispensable source for his life and works. Born in Scotland, Wilkie became a student at the Royal Academy in 1805, and in the following years the uncompromising realism of his scenes from rural life made his name known and attracted royal patronage: he was appointed 'the King's Limner in Scotland' by George IV. This work was compiled by his friend, the poet and critic Allan Cunningham (1784-1842), who himself died shortly after correcting the proofs: it was seen through the press by his son. Volume 3 continues the narrative from 1828, through Wilkie's appointment as the King's Painter in Ordinary in 1830, to his early death.